Next is YOMIURI News Bangkok. Mr.KODAMA was back to Japan already. So, Today`s appointment is New Person, Mr.Sunahama. But He was not in Office today. However We have gift for them. Of course! it is original T-shirt of World Tsunami Awareness Day. YOMIURI News Bangkok, Always Interview to our memorial service. I want to say Thank you so much. We were complete mission on This time! But Still we have a few time. I`m made schedule, Visited at Mr.HASHIMOTO from SiamHoliday. It was working in Phuket. We met to him, and e have been happy time with him. And also we give to him, about original T-shirt of World Tsunami Awareness Day again. Only Two night three days. But I got feel so happy and very Quality time. After, We arrival at Phuket. We fell so good in the mid night with Mr.Saito. 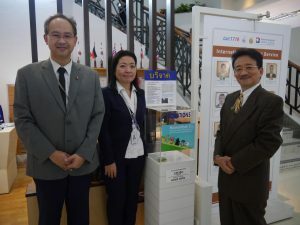 We NPO PLAJA has will continue as much as possible activities to like a bridge, Between Thai and Japan. The keyword are “children”,”future”,”world” and “peace”. Please kindly support for us. And Please join our Event of memorial service and Dinner Party on 5th Nov 2017. When you request, we will send letter of invitation.